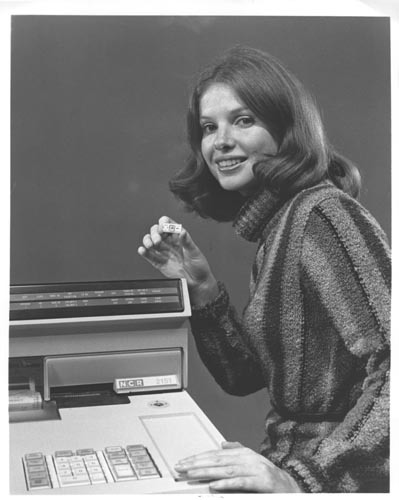 B&W image of woman holding a memory circuit chip.She is standing next to the NCR 2151 retail terminal keyboard. "Memory circuit held by Nancy Seng is representative of microelectronic technology used in new programmable NCR 2151 retail terminal. Packing the equivalent of thousands of electronic components, micro circuits enable the terminal to perform a wide range of functions at the point of service in department stores."